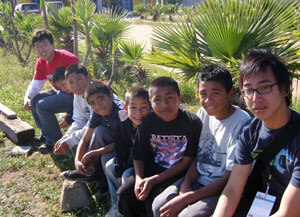 Justin (far left) and another volunteer hang out with the kids they helped during their volunteer trip. When I heard that my church was planning its annual week-long mission trip to Tijuana, Mexico, I didn’t really want to go. I didn’t want to spend my spring break working in the hot sun when I could be playing video games at home. Last year I went and our team built a house for a family. It wasn’t all that beautiful; no electricity, just a two-room 12-by-24-foot cement house. But the family was so thankful for it. In that moment, the "you’re so lucky" I always took for granted started to make sense to me. However, once I came home I forgot about it. Remembering last year’s experience, I was debating if I would go again this year. Eventually, after my pastor kept on asking me, I gave in. He said this year would be different. We would interact more with the people of Mexico, playing with kids and visiting the elderly. To prepare we learned simple children’s gospel songs. We also decided to do sock puppet shows. We had a voice overdub on tape done in Spanish that the puppeteers would move their hands to. We also prepared two silent skits. I was worried because I didn’t know if they would find these things entertaining at all. I also didn’t feel prepared because we didn’t have much time to practice. Finally the day came. It was around 7 a.m. when me and eight other teens and my pastor got into one van. Right after we crossed from the United States into Mexico, the environment totally changed. I saw old houses with chipped paint, broken windows and rusty roofs. The roads were much rockier than some in California. I saw graffiti everywhere and stray dogs every block we crossed. I couldn’t believe that people could actually live here. The smells of Tijuana are even worse. Mexicans burn their trash, creating bad-smelling air. To make things worse, cows are everywhere and the smell of manure is overwhelming. We spent our first day at an old meeting place that had been recently renovated into a church. We invited kids from around the poor neighborhood to come and play with us. They played soccer with us, and we got our butts kicked. We also did crafts. The kids enjoyed having us paint butterflies and suns on their faces. We performed our puppet shows. The kids laughed and applauded for us and danced along to our gospel songs. It felt great. They don’t have lot of chances to get together and participate in fun activities such as crafts and coloring that kids in the United States do. One of my favorite moments was when I gave a testimony (a speech given to make a point) to the kids, which one of the Mexican pastors translated. It was about how I jumped a fence and had to get 52 stitches on my hand. However, I still survived, and the fence barely missed my nerves and tendons, making it possible for me to still play the guitar (which I love). The moral of the story was that God is always protecting us and also that we shouldn’t do stupid things like jumping fences. The kids all got out of their seats to look at the palm of my left hand, which now has a huge scar. 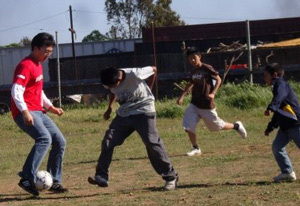 Justin plays soccer with kids from the neighborhood. The entire experience was really fun—painting the church, making peanut butter sandwiches for the kids, playing soccer and just hanging out with the kids. The only part I didn’t like was when the kids dug up worms and chased me around with them. After spending three days with the kids, I really grew attached to them. There was this one kid named Raul. He was only 9 years old, but I swear, he acted like a grown up. He looked out for his sister and took care of his dog. When we were helping to redecorate the church, Raul helped us by painting the wall (as much as he could reach). I thought about when I was 9, watching Nickelodeon all day. I wondered if I would have been like Raul if I were raised in Tijuana. The other kids played around while Raul was responsible. I had an even bigger understanding of how hard life is in Mexico when on the second day, we met "street boys," 11 to 13 year olds who were orphans with no homes. I felt really bad when we had to kick them out, but they were teaching the kids bad words and pushing them around; they even made a little boy cry. We gave them each a peanut butter and jelly sandwich and asked them to leave. I wondered where they would go and if they were hungry. Now I wish that I could have given them more food, even though I was mad at them. After visiting with the kids, we went to a senior center. There were old people sitting everywhere, quiet and stiff. I walked in and their eyes followed me. I thought, "Why do I have to be here?" But after a couple of icebreakers, we became really close to the residents. They told us how about how lonely it was because they never got any visitors. They live on the outskirts of Tecate where you can see desert for miles. There were a limited amount of translators. While they were busy, the best we could do was sit next to the elderly and hold their hands as we watched the puppet shows, which they enjoyed a lot even though they were meant for the kids. We went around praying for them about their health, their lives and that they would be well taken care of. I saw an old man sitting by himself so I decided to pray for him. To my surprise, he gave me a big "gracias" and a smile. By the time we left, I had a tear rolling down my cheek. After going to Mexico, and interacting with the people, I saw that they are like Americans, but just in a different situation. After seeing Raul take care of his siblings and help us paint, I realized that Mexicans are just as hardworking and responsible as Americans, maybe even more so. After meeting the elderly, I shared their pain in living such a lonely and quiet life. I’m sure it was painful for them to live in the retirement center, seeing their friends pass away one after another. No matter who you are, you have emotions like pain and pleasure. I always knew that life in Mexico was a lot harder than life in the United States, but I didn’t know it was as bad as what I saw. I didn’t know that Mexicans had to work for hours and not make nearly as much as they deserve. I didn’t know that finding a job was nearly impossible there. I didn’t know that Mexico had the highest homicide rate in the world. I didn’t know that by working in the United States, you could send money to Mexico and have the rest of your family live a better life. In Mexico, our group leaders told us about these hardships that go on every day in Mexico. Now I understand why people attempt to cross the border. My view of immigration has shifted. I feel bad that I made jokes before about illegal immigration when it is a serious matter. I don’t know what to do about the problem. Letting illegal immigrants freely come into the U.S. will affect our economy, population and resources. But after being in Mexico, I feel really bad for them. All I know is that I can help the poor in Mexico by at least giving up my spring break every year to go there and volunteer.